Get organized about a month before your desired send-out date. This should be six to eight weeks before the wedding, allowing your guests adequate time to respond and ensuring that you will get a reliable head count a week or two before the event. The address on a wedding invitation should be handwritten; printed labels are not appropriate (though calligraphy done by computer directly on the envelope is gaining popularity and acceptability). 2. Do I Need a Calligrapher? 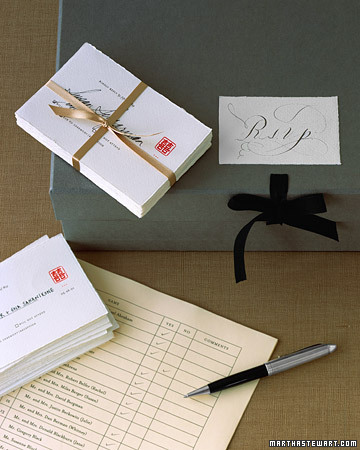 Depending on your handwriting and the level of formality of your wedding, you may want to have your envelopes inscribed by a professional calligrapher. (To find one in your area, ask your stationer or wedding planner for recommendations.) You'll have to get your envelopes to the calligrapher at least two to three weeks before you need them; some calligraphers require even more time. Also provide her with a neatly printed guest list, complete with full addresses and social and professional titles (Mr. or Doctor, for example). Compiling the list, as well as making phone calls to parents or friends to acquire or confirm addresses and spellings, can take some time, so don't wait until the last minute to get started. Alternatively to save cost; you can print the guest lists names on easy-place stickers using Caligraphy font or scout for someone who has a fabulous handwritting! Though etiquette for addressing and assembling invitations has relaxed, there are still some requirements, which we've outlined on the following slides (we've also included a few modern interpretations for more casual weddings). "The little things do matter," says Dorothea Johnson, an etiquette expert "When a couple uses the appropriate honorific and writes out an address in the correct way, it shows they've put thought into it." And when your guests receive your invitation, expertly assembled and addressed, there will be no doubt that you have done just that. 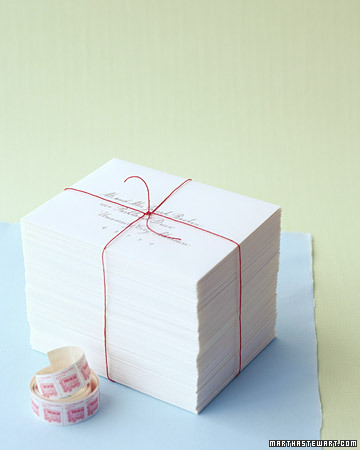 Your guests' names should be written in full on outer envelopes -- no nicknames or initials. Use the appropriate social titles as well, such as addressing married couples as "Mr. and Mrs." If a man's name has a suffix, write "Mr. Joseph Morales, Jr.," or "Mr. Joseph Morales IV"; "Junior" can be spelled out on a more formal invitation. However, it is the different case based on our society culture: big titles such as Datuk, Datin, Tan Sri, Toh Puan, Datuk Sri, Tun etc. Be sure to always include "Yang Berbahagia" or "Y. Bhg" for short. Write out all words here, too. The preferred place for printing the return address is on the envelope's back flap. Traditional etiquette called for blind embossing, or colorless raised lettering, for wedding invitations; the idea behind this was that guests would get their first glimpse of the fancy engraving on the invitation itself. Moreover there are some invites which includes "reply cards" which is much convenient as guests can Rsvp by ticking (yes/no) and mail it back to the sender. These reply cards are complete with return address & some senders also includes stamps too! Parents' first names are both used on this less traditional version of the outer envelope ("Post Office Box" is abbreviated as well). For the inner one, the parents' and children's first names are written without titles. Since they are young siblings, the word "and" (which implies marriage when used with adults' names) linking the children's names is acceptable. For a single woman, either "Ms." or "Miss" is appropriate; many people find the former preferable. The guest's name is the only one that appears on the outer envelope. On the inner envelope, however, write the guest's name followed by "and Guest." If you know whom he or she will be bringing, it's more personal to include that person's name, on a separate line. All enclosures should be printed in the same method and on coordinating papers; here's the order in which they should be stacked to go in the outer envelope. The invitation is on the bottom, print side up. 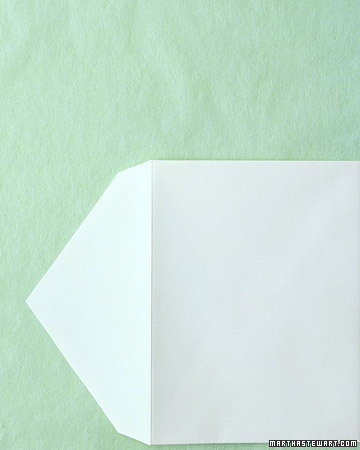 A sheet of tissue paper (originally used to prevent smearing) can be placed over it. 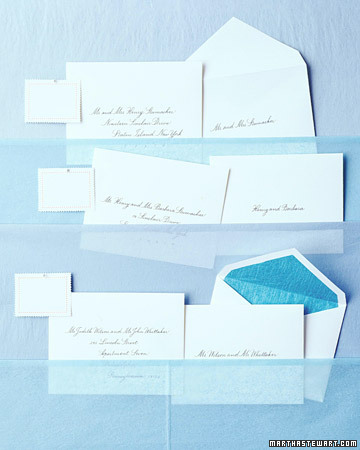 Stack all other inserts, such as a map, reception card, and reply card, on the invitation in order of size (smallest on top). The reply card should be under its envelope's flap; this envelope should be preprinted with the mailing address, and should be stamped as well. Insert everything into the inner envelope with the print side up, so that when guests open the envelopes they will see the lettering. 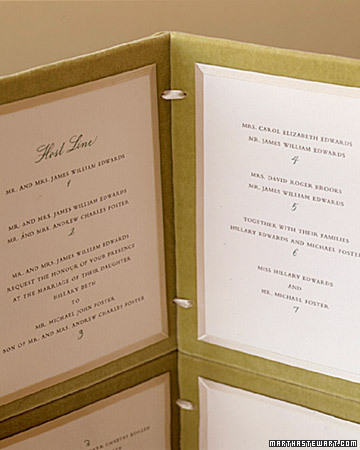 (The same rules apply with a single-fold invitation, where the print appears on the front. For a French-fold, or double-fold, invitation, which has the print inside, all enclosures go inside the card.) Slip the unsealed inner envelope into the outer envelope with the names facing the back flap. You can take your invitations to the post office and request that they be hand-canceled. Machines print bar codes on the envelopes, but hand-canceling -- just marking each stamp -- keeps invitations neat and prevents damage that machines can cause.